There was once a little porcupine that lived in the forest with all of his friends. But he was often sad, for he noticed that his friends played together. They laughed together and really seemed to enjoy each other. He really loved to watch them play together. He wanted to play with them too, but it always seemed when he drew near they stopped playing together. Some of them complained that he was there. Some grumbled and others actually told him to go away. This always hurt his feelings. Why didn’t they like him, he wondered? He was fast so he could do well in the running games. He was smart so he could do well in the thinking games and he had the right color so he could do well in the hiding games but it seemed no one wanted him around. He often went to the water’s edge and looked at himself in the water and pondered why they just didn’t want to play with him. He just didn’t understand it. So he decided he would pay attention to what was happening the next time he went to play with his friends to see if he could understand why they always complained and sent him away. “It wasn’t funny,” said bunny in the back. “Ok fine, forget it,” declared porcupine. “Let’s play hide & seek and I will be it.” He proceeded to count to 10 and all the animals scattered except bunny. She sat motionless and on the count of 10 porcupine opened his eyes and yelled, “ I see bunny! I got you bunny, you are right in front of me. Can’t you hide better than that?” With that, he went off to find all the other animals. He found them all in record time. “That was fun,” he said “Let’s do it again.” Beaver said he needed to go and porcupine said, “Don’t go. You are great at hiding unlike bunny who can’t seem to find a hiding place,” he quipped. Turtle spoke up, “Why do you do that?" “What did she have to be afraid of? We were only playing hide & seek.” She was probably afraid you were going to shoot your quills again,” responded turtle. 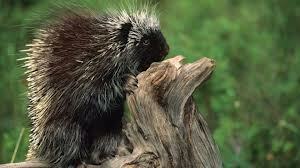 “I do not shoot my quills,” retorted porcupine raising his voice. With that, turtle withdrew into his shell and one by one the animals all went home. Porcupine went to the water’s edge and murmured and grumbled about how he really didn’t enjoy playing with them anyway. And he insisted to himself that he did not throw his quills. Why look how smooth and nice my quills look, he thought to himself as he looked at himself in the water. Look how nice my quills look laying down my back. They are out of their minds, he thought. I’ll find someone else to play with tomorrow. The next day he noticed a group of frogs playing leap frog and he watched them jump over one another. He practiced jumping. He thought to himself he could do that. “Hey guys, can I play leap frog with you?” he asked. “Yeah, right up until you lift your quills and we get stabbed, “ the frogs mocked. “You promise not to lift your quills?” inquired one brave frog. I don’t lift my quills, he thought to himself. So frog took a running leap and just as he got close to porcupine, the quills lifted and “ouch, oh ouch” cried frog as he tumbled onto the ground. Porcupine began to laugh. ”What are you laughing at?” demanded one angry frog. “I did not,” porcupine fired back. “Oh yes you did! We all saw it,” frog said while all the frogs shook their heads in agreement. “You're lying. You just don’t want to admit your friend can’t jump as high as me,” concluded porcupine. “We can prove you lifted your quills. Look at our friend’s stomach” and the hurt frog showed porcupine all the puncture marks on his stomach. “Well you can forget it. We aren’t playing leap frog with you,” they all said together and with that they all stormed off together leaving porcupine all alone. He took one look at himself in the water and reassured himself that he was as smooth as ever. For he was indeed completely smooth when he saw himself in the water. Ker plunk went the noise in the water. Porcupine quickly reeled around. “What was that? he said. “Just a rock I threw in the water,” owl said. Turning in the direction of the voice, porcupine began to laugh when he saw owl. “What did you do? Fly into a cactus?” he mocked. “What do you mean?” questioned porcupine. scared you with the rock in the water,” owl informed porcupine. “I don’t throw my quills,” porcupine insisted. “Really,” retorted owl. “Not only did you throw your quills but you raise them any time you get nervous or let anyone get close to you. Just like you did when frog got close to you to jump over you. You instinctively raised your quills to not let anyone get close to you,” explained owl. “I do not do that. I did not do that to frog. He hurt himself when he landed,” insisted porcupine. “Will you believe it if I prove it to you?” questioned owl. reflection in the water and all his quills were standing straight up in the attack mode. “Look again,” said owl from the branch of a near by tree. Porcupine looked at himself in the water and he was as smooth and as slick as he always saw himself. “Why I look like myself again. How did you do that?” inquired porcupine. “I did that? How?” questioned porcupine. “Whenever someone gets close to you, your barbs raise to protect yourself because you think in your mind someone is going to attack you. So as quickly as you think it your barbs are up. But when you are alone, thinking no one is going to attack you, you look in the water and you are relaxed and you see yourself as smooth. While you attack everyone and everything else assuring yourself you are not the problem. Then when you really get scared you throw your barbs like you did today when the rock landed in the water. I received many of those quills,” owl informed porcupine. “Yes, those were not cactus spikes like you tried to laugh about. They were your quills,” explained owl. “To help you, my friend,” said owl. “Did that hurt?” porcupine asked, seeing the blood drops on his feathers. “Well do you remember how you made fun of bunny for not hiding well?” asked owl. “I did that?” questioned porcupine. “What do I do?” porcupine questioned. So one by one porcupine asked his friends to forgive him for acting like there was nothing wrong with him and treating them with such unkindness. Then he asked them to help him not to attack them and defend himself like he used to, and sometimes you can see them even laughing with each other. For they now have learned to forgive each other in this new kingdom rather than use their old natural defenses and be bitter towards each other. Now they love living in the new kingdom and have learned to hate their real enemy who had taught them to be unkind one to another.